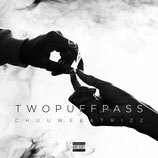 "CHUUWEE & TRIZZ - TWO PUFF PASS"
Chuuwee & Trizz drop a new seven track EP "Two Puff Pass". The EP includes six tracks produced by Ac3 Beats and one track assisted by Money Montage and Chris Rose. Lyrical guest appearance on two tracks comes courtesy of Roc$tedy who is part of the Break Bread Posse (a crew that also includes Chuuwee, Trizz, Ac3 Beats and Monibeatz). The L.A. based Trizz and Sacto's own Chuuwee have released two previous albums together "AmeriKKa's Most Blunted" (2015) and "AmeriKKa’s Most Blunted 2" (2016) and an EP titled "The Smoke Out" (2016). Speaking on the inspiration for the new EP, Chuuwee said "a lot of people were asking online if we were dropping any new material together. I figured it wouldn't be a bad idea to do something new. Trizz and I both agreed it should be all Ac3 Beats production, like our first project together."